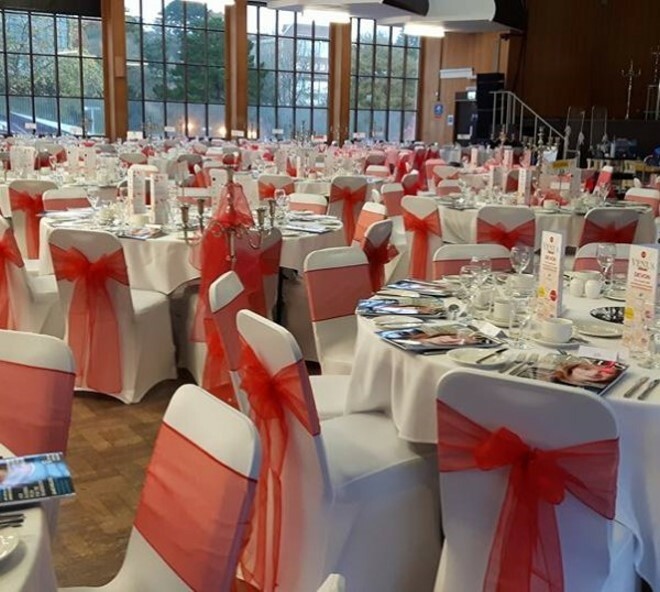 Venue Dressing and Decorations for Corporate Dinners and Events in Exeter, Newton Abbot, Torquay, Paignton, Plymouth and Devon. Whether you are holding an awards dinner, company dinner, product launch, gala night or any other function you will want to make it look special. Decorate chairs with covers and sashes to match colours of your theme, along with table centrepieces to reflect the occasion. Colourful balloons add height and provide that extra magic to any celebration and can be printed with your logo or message. Add drapes, bunting, fairy lights and coloured uplighters to really transform any room. Whatever the occasion we believe it should be special and our team will help you to achieve the look and atmosphere you want. All our decorations include a full set up and fitting service so all you have to do is decide what you want and then come along and enjoy the event.